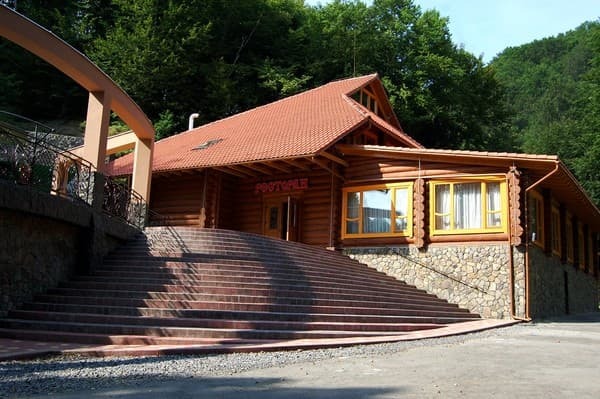 The hotel and restaurant complex "Zatishok" is located in a picturesque corner of Transcarpathia, on 745 km of the Kiev-Chop highway - near the resort and sanatorium zone, famous for its healing Svalyava mineral waters. The hotel has 6 comfortable rooms in the category "standard", "junior suite" and "suite". Each room of the hotel "Zatishok" is decorated from a natural carpathian log cabin, which provides holidaymakers an environmentally friendly holiday. All rooms of the hotel complex are equipped with a double bed, a wardrobe for storing things, a safe, mini fridge, plasma TV and a private bathroom with a shower. Free Wi-Fi is available. 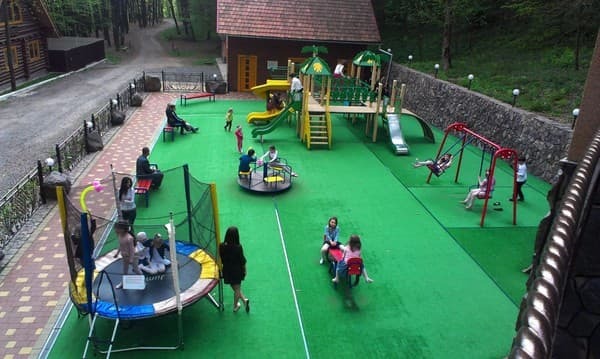 To services of visitors: restaurant of the Ukrainian and Transcarpathian cuisine (it is intended for 150 visitors), a bath complex, a billiard room, arbours-small houses, and for small lodgers - a children's playground. For guests who have arrived by car, a free parking lot is provided under video surveillance. The distance to Svalyava is 4 km, to Mukacheve - 31 km and 71 km to Uzhhorod. 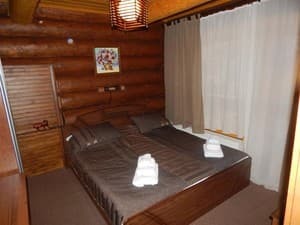 Description of the room: One-room double room with a natural carpathian log cabin. The room has a large double bed and all necessary accessories for a comfortable stay. 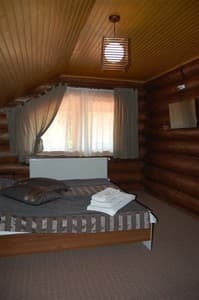 Description of the room: Two-room suite with a natural carpathian log cabin. In the bedroom there is a large double bed, in the hall there is a large folding sofa (there is a possibility of placing both 2 and 4 persons). 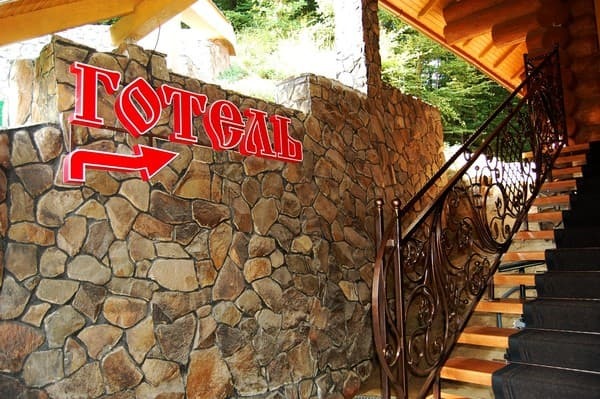 Description of the room: Two-room suite with a natural carpathian log cabin. In the bedroom there is a large double bed, and in the hall there is a sofa bed (there is a possibility of placing both 2 and 4 persons). From the bedroom there is an exit to the balcony, and from the living room there is an exit to the balcony and a large terrace. On the terrace there is a corner where you can relax, enjoying the beautiful view of the Carpathian forest. 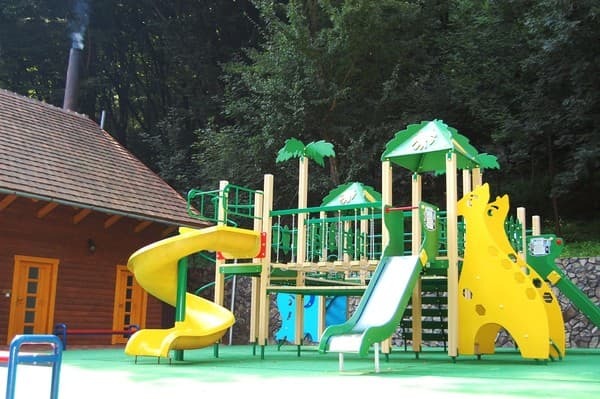 Accommodation of children without extra bed is free of charge. The cost of additional space is 70 UAH (the price is indicated with breakfast). 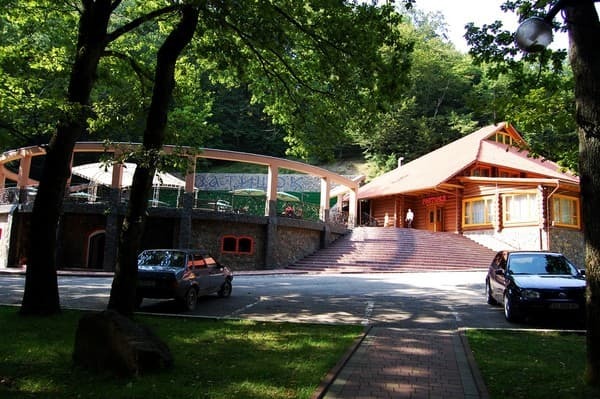 On the territory of the complex there is a restaurant where tourists can taste dishes of Ukrainian and Transcarpathian cuisine. The hotel and restaurant complex Zatishok is located in a picturesque corner of Transcarpathia, at 745 km of the Kiev-Chop highway. The distance to Svalyava is 4 km, to Mukacheve - 31 km and 71 km to Uzhhorod. Hotel and restaurant complex "Zatishok" is located on 745 km of the route Kiev-Chop.